Item #8B (Magnum 45-70, 405 gr. JFN) = roughly 2,000 fps in a 22 inch Marlin, but it’s Lower Recoil counterpart of item #8I produces 1630 fps in the same rifle and 1585 fps in an 18.5 inch Marlin Guide Gun. 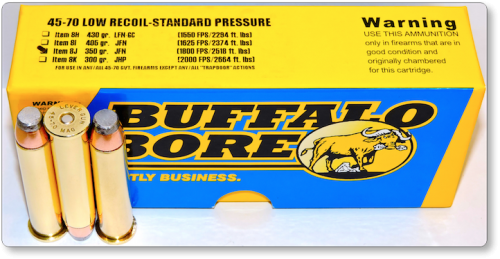 Both the Magnum and Lower Recoil versions are designed to kill game animals of up to 800 lbs. This is a somewhat soft bullet that mushrooms greatly on game animals and penetrates around 30 inches in living mammalian material. Item #8C (Magnum 45-70, 350 gr. JFN) = roughly 2,150 fps in a 22 inch Marlin, but it’s Lower Recoil counterpart of item #8J produces 1845 fps in the same rifle and 1762 fps in an 18.5 inch Marlin Guide Gun. 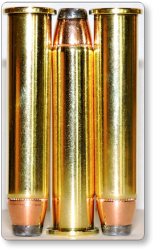 Both the Magnum and Lower Recoil versions are designed to kill game animals in the 1500 lb. class and yes this 350gr. JFN bullet out-penetrates our 405gr. JFN bullet, due to its tougher construction and therefore smaller mushroom—expect around 48 inches of penetration in living flesh and bone. Item #8E (Magnum 45-70, 300gr. JHP) = roughly 2,350 fps in a 22 inch Marlin, but it’s Lower Recoil counterpart of item #8k produces 1979 fps in the same rifle and 1879 fps in an 18.5 inch Marlin Guide Gun. Both the Magnum and Lower Recoil versions are designed to kill game animals up to the 300-400 lb. class. This is a lightly constructed bullet that mushrooms violently, makes an enormous wound cavity and penetrates up to 24 inches in living game animals. I used this round in my new Henry. Shot 'balls on' accurate right out of the box, taking only one adjustment to site in. Hunted wild pigs in South Texas this year and bagged a very nice 180 pound boar with a single shot. Accurate with controllable recoil.